In exactly the same way that verbal language is composed of words that form phrases and sentences, art is made up of colors, spacing, and objects whose meanings, acting as words, can be put together to form sentences that tell the story of the painting as a whole. In this post I will cover some common objects and their meanings, which can help you understand your favorite paintings in a new light. First let’s discuss the lion, a good example of how the meaning of a symbol can change with time and place. 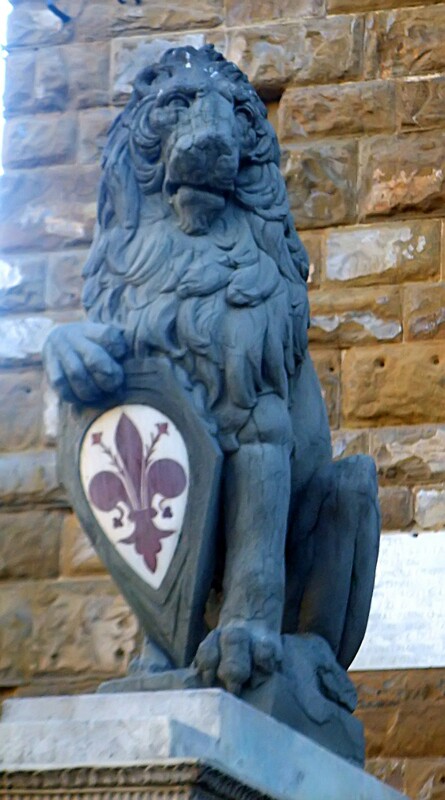 The lion is one of the ancient attributes of Saint Jerome, who is known for removing a thorn from a lion’s paw earning the lion’s loyalty. The lion stayed with Saint Jerome the rest of his life. Saint Jerome is also known for translating the bible into Latin. 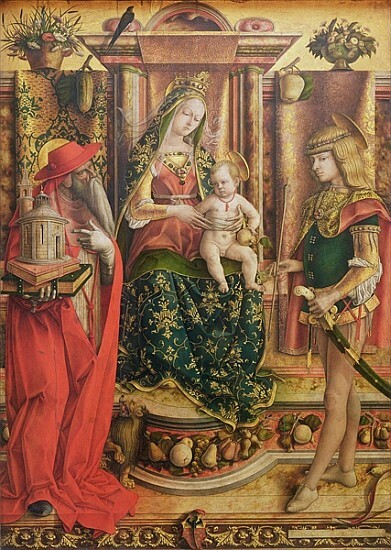 In many paintings featuring Saint Jerome he is holding the bibles he translated and there is a lion depicted somewhere in the frame, as in the painting of Madonna della Rondine by Crivelli in 1490 now housed in the National Gallery of London. 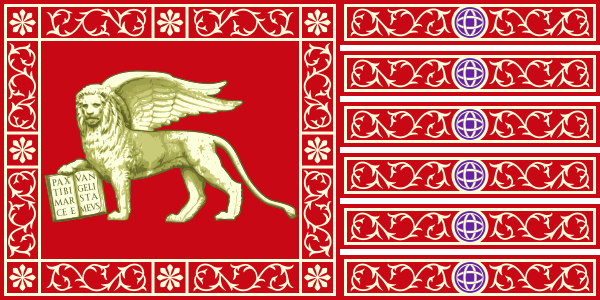 So, the Marzocco is a symbol of Florence’s status as a free republic and encompasses the ideals of that status. In this painting of the Madonna della Rondine by Carlo Crivelli circa 1490 we see many different objects that hold meaning. On the left, we see an old man holding bibles, dressed in red (cardinal’s robes and broad rimmed hat), with a lion as his feet. As discussed, it is Saint Jerome, identifiable by the objects around him and their meaning. Any of those things in combination with an elderly male would give a clue that the person depicted is Saint Jerome. The rest of the painting is filled with ecclesiastic symbols and meanings. The halo glow of light around the center figure’s head is symbolic of Mary’s status as a holy being. The swallow perched on the top left of Mary’s throne is symbolic of Jesus who was buried, then rose again, because swallows were believed to hibernate in holes in the muddy banks of rivers during the winter and went there for the whole season before coming back in the spring. The apple Jesus holds is a reference to the fruit in the garden of Eden. Christ hold the apple, symbolically taking original sin upon himself as a redeemer. The baby Jesus himself is an indicator that the figure cloaked in blue is Mary. Her blue cloak is also symbolic of heavenly glory. The figure on the right holding an arrow is Saint Sebastian, a Roman soldier turned Christian who the Romans tried to kill by shooting him with… wait for it… arrows! As the young man is holding an arrow, it identifies him as Sebastian. The quince fruit above Saint Sebastian is another allusion to Eden, because the forbidden fruit is not named in the bible. Apples, figs, and quince were all thought to be possibilities by renaissance clergy. Quince fruit in other paintings can symbolize fertility and marriage. The grapes represent Jesus’ suffering on the Cross, and is indicative of the wine at the last supper, which came from grapes. In this painting the grapes are next to a pear, whose rounded shape is a reference to Mary’s fertility and fruitfulness. The pomegranate is a fruit that refers to Christ’s death and resurrection, as well as the church because it is one body that contains many seeds. The gourd above Saint Jerome can also be seen as a symbol of Christ’s resurrection because it was mentioned in the story of Jonah who was in a whale for three days before being vomited onto dry land. In the next installment of Symbols in Italian Renaissance Art I will discuss the painting of Ginevra de Benci by Leonardo da Vinci and Portrait of a Lady by Tiziano Vecellio (Titian).